Cornerstone's ScreenPro assigns applications to user-selected real estate on big monitors. Only the largest ones receive the full advantage the layout utility provides. Bigger is better, at least for monitors. The jumbo ones are easier to read, can fit bigger images on a screen and let you work in several applications at once. Now that the processing power of the typical desktop PC has shot through the roof, truly productive multitasking is possible. But juggling all the applications is no breeze. Even if the computer can handle the strain, your eyes sometimes cannot. Sizing and resizing the multiple windows becomes a daily pain. 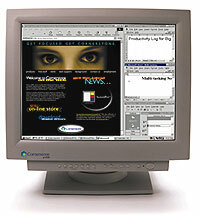 ScreenPro, a utility developed by Cornerstone Peripherals, a pioneer in large imaging monitors, will work with any monitor and graphics card. It sets up the big screen with frequently used applications arranged in neat windows. The utility is a free download from the Web, at www.bigmonitors.com, but you have to fill out a pretty extensive form to get it. I tested it with several monitors, none made by Cornerstone. The program was easy to operate and quite useful. I opened up all the applications I might need during the day, then clicked ScreenPro's icon on the task bar. It gave me a choice of templates for configuring the screen, putting an Internet browser, say, in a large window and a word processor and spreadsheet in smaller ones. When I was done, everything went neatly to its assigned place. ScreenPro has a choice of six templates, most with either four or five open windows. Each template is significantly different from the others, though I would have liked to see a split-screen design. The fewest number of windows you can have open is three, and even on the largest monitor, six open windows gets to be a bit much. Once the layout is configured, you can still minimize and move windows if you choose. Copying images or files among programs with open windows is quite easy. For the most part, you simply drag and drop files once you have all your ducks in a row. Several small features make ScreenPro easy and useful. Say you need to get at a program icon sitting behind all the neatly configured windows. Simply click the Minimize All button, and the open programs will revert back to icons so you can see the rest of the system. Although ScreenPro works with any monitor, you need a 19-inch or larger screen to take complete advantage of the layout utility. I tried it on 14- and 17-inch screens, and the windows it drew were too small. It's helpful to set the big monitor to a high resolution, as lower resolutions fit less data into the smaller windows. Even on a 19-inch screen, some windows will not have enough viewing room, especially with six windows open. On a 21-inch screen, though, you can spread out and multitask to your heart's content.